Learn more about the Lorex 8-Channel 2K Resolution Home Security System with 8 IP Cameras. Get pricing, and answers to common questions. 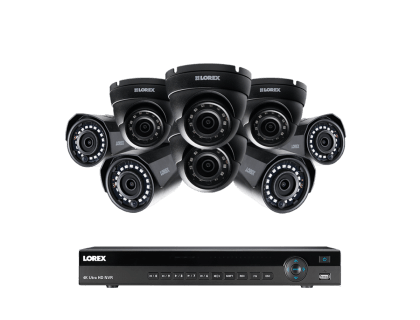 The Lorex 8-Channel 2K Resolution Home Security System with 8 IP Cameras includes an eight-channel NR900 network video recorder (NVR) and comes with eight weatherproof IP cameras. This Lorex business security system has excellent color night vision capabilities. 4 bullet + 4 dome 4mp IP cameras. Pros: 2K security cameras provide you with rich details and clarity, and an increased ability to zoom in on distant objects without significantly reducing image quality. Cons: Cameras' field of view restricted to 90°. Bottomline: Security system to protect your growing business in all weather. What are some alternatives to the Lorex 8-Channel 2K Resolution Home Security System with 8 IP Cameras? Where can I buy the Lorex 8-Channel 2K Resolution Home Security System with 8 IP Cameras? The Lorex 8-Channel 2K Resolution Home Security System with 8 IP Cameras is available via Amazon and the Lorex website. Does the Lorex 8-Channel 2K Resolution Home Security System with 8 IP Cameras work at night? Yes. This security system's color night vision (CNV) technology enables both sets of IP security cameras to deliver full color video, even in low-light conditions, and provides details to identify people or objects around the clock. The Lorex 8-Channel 2K Resolution Home Security System with 8 IP Cameras has a night vision range of up to 150 ft. in ambient lighting. Can the Lorex 8-Channel 2K Resolution Home Security System with 8 IP Cameras be used in any weather? Yes. This system's IP-66-rated security cameras with metal casings continue working in inclement weather. They have been tested in temperatures as low as -22 °F, and can function in temperatures up to 140 °F.